Algonquin Young Readers, 9781616204068, 160pp. In their trademark style, author Kate Klise and illustrator M. Sarah Klise blend a story bursting with jokes, puns, and wordplay with illustrations, signs, letters, recipes, and bold graphics to introduce Three-Ring Rascals. When Sir Sidney, a kindly old circus owner, becomes too tired to travel with his show, he places a Help Wanted ad in the newspaper. Enter Barnabas Brambles: “I have a degree in lion taming from the University of Piccadilly Circus.” But does Leo the lion need taming? Will Elsa the elephant still get her gourmet peanuts? And what will Brambles say when he discovers Bert and Gert—two mice who travel with the circus on popcorn cleanup patrol? Brambles has big plans: More cities! More shows! No more free popcorn. 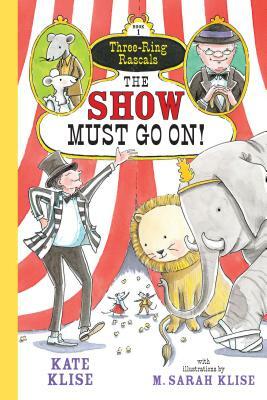 Soon he’s made a big mess of Sir Sidney’s Circus, but Leo, Elsa, Bert, Gert, and the rest of the performers agree: The Show Must Go On!